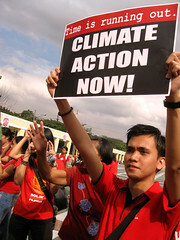 An environmental activists displays a banner that reads: "Climate Action Now!" I felt my heart beating faster than usual as I clapped along to 2 sheer minutes of booming beats that reminded of the loud noise that led to the crumbling of the walls of Jericho in the Biblical narrative. This morning we along with other groups and individuals sounded the alarm for climate action as part of the activities that are a part of the December 12 Global Day of Action on Climate Change. December 12th 2009 activists, and concerned citizens of the world held global actions to highlight the urgency of climate action at the time of the United Nations Talks on climate change (COP15/MOP5) in Copenhagen, Denmark.